Since the Affordable Care Act (ACA) was first proposed in July 2009, the benefits industry has been working in a state of “hurry up and wait.” Hurry up to meet the compliance deadlines, while we wait to see what might change. From deadline delays to nearly-overturned-but-not-overturned components of the law, we’ve been through the wringer. Now, with two cycles of ACA reporting nearly complete, we await possibly the biggest ACA changes yet. The International Foundation of Employee Benefit Plans is here with the information you need. ACA repeal, replace, status quo? We’re on it and will continue to deliver the resources you need so you can hurry up and meet the compliance deadlines still in place without having to sift through the dizzying volume of media buzz. Our members have come to rely on ACA Central and ACA University throughout implementation of the law. As we transition to a new era of uncertainties, ACA Central continues to offer news, analysis and the latest regulatory developments. ACA University shares the latest with you via full, live webcasts, Q&A sessions with industry experts and weekly ACA FAQs. What does it take to change the law? There are many steps to repeal the law and many more to replace it. Here, you’ll find details on the possible paths ACA change could take. As Congress works through the steps to repeal and replace the law, we’ll provide you a play-by-play. 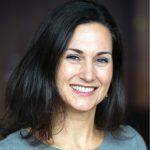 What now for plan sponsors? As long as ACA is still law, employers still must comply with all its provisions. Check here for helpful resources as you continue to work on meeting the requirements. Go ahead and carry on with your ACA compliance to-do list, we’ll let you know when it’s time to wait. 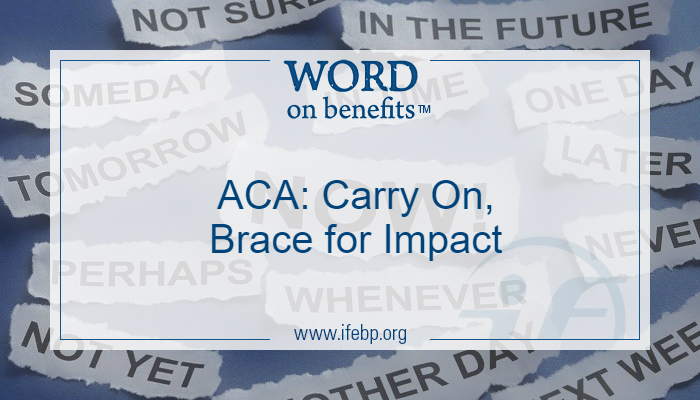 Watch for alerts of new ACA developments in Today’s Headlines and here on the Word on Benefits! What about the provisions of the HIPAA law passed years ago that prevented discrimination against people with pre-existing conditions? If Congress does repeal ACA without replacing with something better or similar immediately, don’t people still have the protections of the Kennedy-Kassenbaum HIPAA bill? Isn’t there a safety net already in place? I shudder to think they might be successful in doing away with some of the best provisions of the ACA. This part is one of my biggest concerns, among many.